Sashastra Seema Bal announced ssb recruitment for the year 2015-2016.This recruitment is only for sports quota.Name of the post is constable(GD). The total vacancies are 375.Both male and female can apply. SSB,Government of india,Ministry of home affairs said the posts are temporary but likely to be continued The last date to apply exam by eligible candidate is 30 days from the announcement.So try to apply within end of april month. Don't wait for last day.As per the 30 day rule the date to apply for this job will be may1 (or) may2. However it is recommended to apply for this job as soon as possible. 1.Age must in between 18 to 23 years.However age relaxation available for the different categories.Kindly read the full advertisement attached at the end of this post. 2.Education qualification is matriculation or its equivalent from a recognized board. competition in any of the games/ sports mentioned in the list below.We suggest to read the attached document for full details for the sports qualification. The salary is Band -1 type starts from Rs.5200 to Rs.20200 + Grade pay Rs.2000. The allowances are Dearness Allowances, Ration Money. Washing allowances,Special Compensatory Allowance while posted in specified border area ,free uniform, free accommodation or HRA. Transport Allowances, Free leave pass and any other allowance as admissible in SSB from time to time under the Rules. 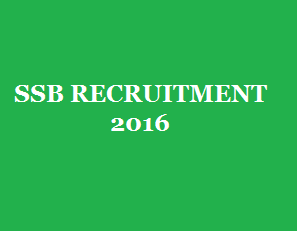 How to apply for ssb recruitment 2016? Self attested matriculation,caste certificate,permanent resident & sports certificates . Fee of Rs.50 in DD or IPOor banker cheque. 2 self addressed envelope 11.5 cms x 27.5 cms worth rs.25 with postage stamp to be affixed on each envelope.